As of 2017 Friday Harbor Art Studio has moved to my new home studio location at: 321 Geneste St. Friday Harbor, WA 98250 (same phones and emails listed below). Custom PICTURE FRAMING services will continue in the new location. However, hours will be irregular. Clients will need to call first (360.378.5788). Artwork: Years of sailing on historic tall ships, schooners and sloops led to an all-encompassing interest into the construction, maintenance and handling of traditional sailing vessels. Sailing a replica whaler led to the study of whales and participation in whale research. 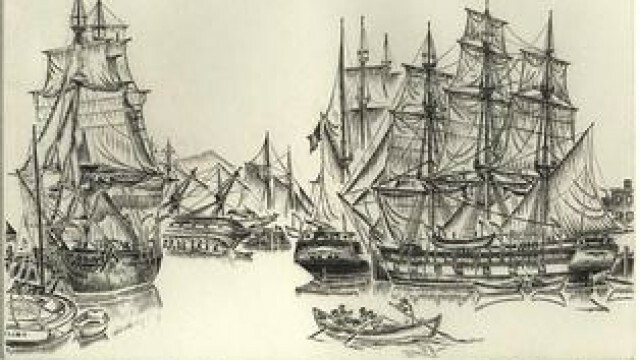 I’ve since established my credentials as an artist of sea life and accurate, historic, ship portraits in scrimshaw, pen & ink, drypoint engraving and carving (Free Willy II amulet). Awards include four Mystic Internationals and I am an artist member of the American Society of Marine Artists since 1982. My studio/gallery, Friday Harbor Art Studio, is in it’s 25th year. I have been doing custom scrimshaw for over 40 years. I specialize in ship/sailboat portraits but have done everything from people to horses to helicopters; as large presentation pieces, belt buckles, pendants and plaques. When I began whale’s teeth had no commercial value and they were being given away. Later, when ivory became controversial I began to ‘scrimshaw’ copper plates, which is drypoint engraving, a non-acid etching technique that dates from 1400. The engraved copper plate is used for pressing limited edition prints. As a professional picture framer, custom framing for all of the above is also a specialty, as well as the best acid free, art conservation presentations. I sometimes add scrimshaw remarques on antique piano keys, mammoth or fossil walrus ivory to the framed prints (click on About Me for more). Finally, newly enacted ivory laws make commercial use for my artwork problematic, except for ivories documented to be over 100 years old, like fossilized and mammoth ivory.